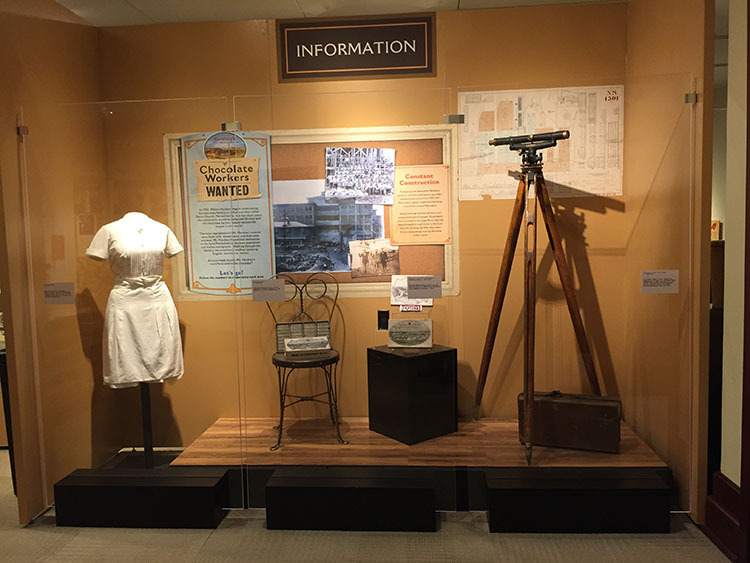 Do you want to take a sweet escape to Chocolate Town USA – better known as Hershey, PA? 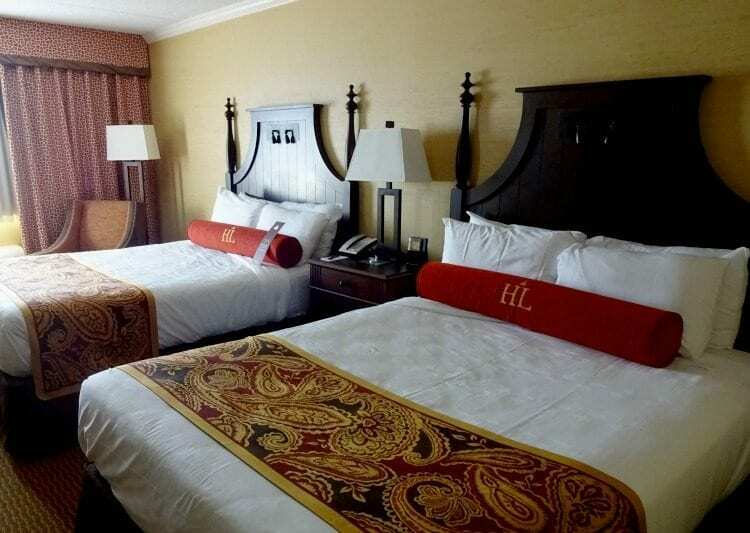 The Hershey Lodge is located minutes from the world famous Hersheypark theme park and Hershey’s Chocolate World along with many other great attractions. With an indoor waterworks pool, game room, mini golf and more, this family resort is perfect for a weekend in The Sweetest Place on Earth. 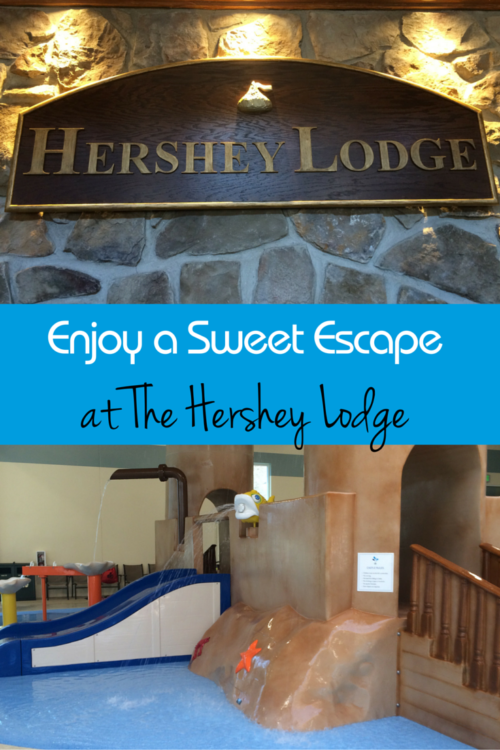 Last week my daughters and I enjoyed a stay at the fabulous Hershey Lodge in Hershey, PA. Hershey is less than 90 minutes from our house so we never thought about staying the night while on day trips to Hersheypark. Having stayed at the Hershey Lodge, I can now say we will certainly be back for a staycation weekend. The Hershey Lodge is a large hotel with 665 guest rooms. Being there for only one night, we still don’t know all the ins and outs to finding our way around the resort. 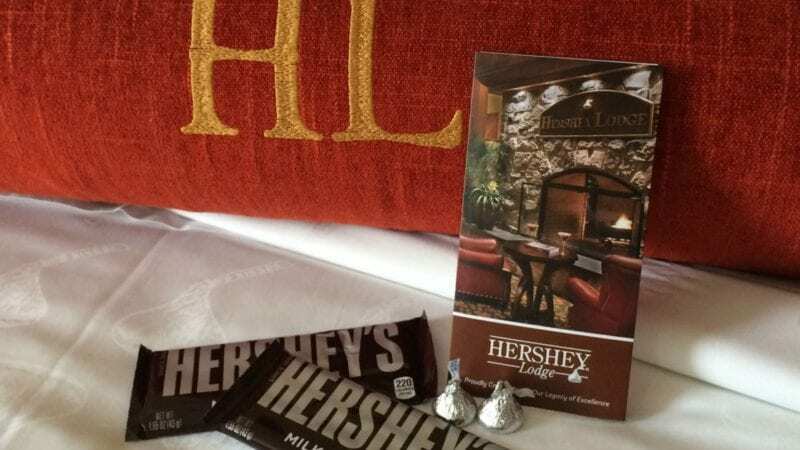 But we do know this: the Hershey Lodge has the feel of an upscale resort with a mid range price tag for family travel. Sweet! We booked a standard two queen room in the Hershey Kiss Tower. This location was ideal in my opinion because it is attached to the main lobby. On the website I didn’t see the room categories sorted by location. The front desk did say you can call and request a section of the hotel and they will note your reservation. A few of the areas were pretty far from the main lobby and that isn’t ideal with little ones. I would suggest the Hershey Kiss Tower or Reese’s Peanut Butter Cup area as they are close to everything including dining, waterworks pool area and park shuttle. The rooms are well appointed with two queen beds, a desk, a small refrigerator, an in-room safe and a very large closet. Plenty of room for a family of four. We loved the little chocolate touches with Hershey kisses printed on the sheets and the bathroom wallpaper. A little sweet treat even greeted us on our night side table. Upon arrival, a smiling bellhop greeted us and directed us to ten minute parking for check-in. We arrived around 2 p.m. and check-in was a breeze, very quick and informative. The desk clerk gave me the run down about park hours, shuttle bus times, and discount park tickets that can be purchased as a resort guest. We also received a hotel map, resort guide and full size Hershey bars. You had us at free chocolate. The Hershey Lodge offers a kids’ check in as well from 4-6 p.m. daily. Kids can sign the guest book and receive a personalized Hershey Lodge lanyard and a coloring book. They may even get to meet a character in the lobby if arriving between 4-5 p.m. This desk will also give you an activity sheet for that day. We lucked in as they had free kids bingo and evening s’mores (small fee for kit) roasting by the fire pit. Our room was ready but we had a bit of difficulty finding parking anywhere near our tower building. That is really the one and only downside to a stay here. If you have a room adjacent to the lobby, parking is next to impossible. I chose to valet for $18 for the night as I wasn’t going to need my car until the next day. Once we settled into our room, we were starving. The Hershey Lodge offers a casual restaurant on the main level called The Bears Den. If you are a hockey fan, you will love the theme. It’s dedicated to the Hershey Bears hockey team. The prices were comparable to most casual chains, which blew me away because it is located in a resort. Service was a little slow, maybe because it was late afternoon, but the food was good and we had large portions. The kids wanted to go to Hershey’s Chocolate World and see the new ride, so we grabbed the free shuttle just outside the lobby. The shuttles are nice and the drivers are very informative. Having a free park shuttle saves you $20.00 on parking at the gate. You are dropped at the front gate and the entrances to Hersheypark and Chocolate World. No trams and no extra walking are necessary. As a Hershey Lodge guest, you get the VIP front door treatment. 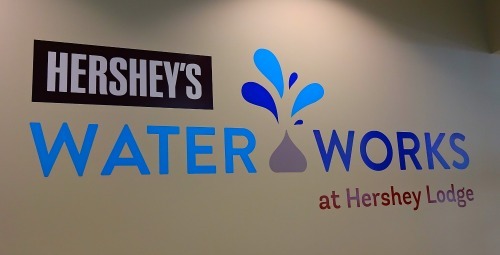 After our chocolate afternoon, we decided it was time to enjoy Hershey’s Waterworks for the rest of the day. This brand new addition to The Hershey Lodge was a hit with both of my girls. I worried my 16 year old would think it was too childish. But no worries – she had a blast on the water slides and trying to cross the Reese Cup bridge. Just think of kids and adults on slippery, moving pucks in the water. The Waterworks is a great addition for an evening of fun after a long park day or a break from the park all together. We enjoyed a light dinner from the fast casual restaurant, Cocoa Cabana, located inside Hershey’s Waterworks. They offer fresh salads, light appetizers and burgers. Again I was not disappointed in the price. For a resort hotel, the dining options were not crazy expensive at all. TravelingMom Tip: They do have a poolside bar, which opens each evening at 5 p.m. I was grateful for my sangria! Admit it moms – sometimes we just need to take the edge off, especially when traveling without a spouse. After playing at the Hershey Waterworks for three hours, we headed back to the room and got ready for our adventure in Hersheypark the next day. Being in the sweetest place on earth, I decided to surprise the girls with a sweet treat from room service. Warm cookies and milk were the perfect ending to a wonderful day of relaxation at the Hershey Lodge. The Hershey Lodge is the perfect place for year round fun for families in the Sweetest Place on Earth. With the Hershey’s Waterworks located indoors, you can take a trip to Hershey in December and see the twinkling lights of Candylane. No matter when you decide to visit, it will be a sweet treat. Have you enjoyed a sweet stay? 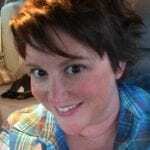 Jenn is a Maryland Mom of two girls and is married to a Road Warrior who travels 60% of the year for work. She loves to travel any chance she can, a trip can be last minute or planned in advance; either way is fine with her. A self proclaimed Orlando expert; she can tell you everything you need to know about the Number One Vacation Destination in the U.S. Jenn can be found writing about Orlando and her own adventures on her blog Journeyswithjenn.com. No destination is ever off-limits for Jenn and her family. We went to Hershey a few years ago, it was fun. This looks like a great trip for the family! It is a fantastic place! I stayed at the Hershey Lodge Thursday night to attend the quilt show. The Lodge was beautiful, the quilt show was spectacular. My BIGComplaint: for the price of the food, the food was awful. The ham sandwich at the show lobby was a disgrace. Dinner for the price terrible. Breakfast buffet just okay lunch, terrible. Plenty of help, all very courteous and helpful, water stations, wonderful. Lots of chairs for resting. Loved sewing for charity, free parking. You would sell more candy if you lowered the prices. I watched a staff member watching service at breakfast, service for my party of eight was okay, lots of food was left on my plate. You need to know.